The recipe for these delicious Guo tie comes from the famous food blogger, Bee Yinn Low's new book, Easy Chinese recipes, Family favorites from Dim Sum to Kung Pao. 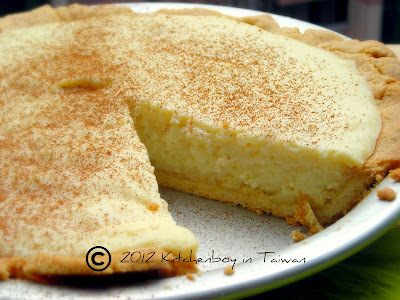 Of course she also has an equally famous blog, www.rasamalaysia.com, full of great recipes! Her recipe is used with her permission. Thanks Bee! On 5 February 2012, it will the 9th anniversary of my arrival in Taiwan. I arrived here with 20kg of clothing and other belongings in my backpack and not a clue what to expect from the country, the people, their culture or their food. I am ashamed to say that it has taken me this long to try my hand at cooking Taiwanese food. I blame the ever present language barrier. Believe me when I say, it isn't that easy to learn how to speak Mandarin Chinese like local. But I try. These dumplings are not difficult to make, and making 20 of them shouldn't take you very long. I made 200 of them on my first attempt and that took quite a few hours! They freeze incredibly well, so do make a few extra. They make for a quick, convenient light meal in minutes. Recipe adapted from Easy Chinese Recipes by Bee Yinn Low. Combine the flour and water to form a dough. Knead the dough until it is no longer sticky and the surface becomes smooth - about 10 to 15 minutes). Cover with a clean, damp cloth and let it rest for 30 minutes. On a flat, foured surface, divide the dough into 2 equal portions and roll them into cylinders, 2.5cm in diameter and about 13 cm in length. Cut each cylinder into 10 equal pieces, each about 1.25cm thick. Using a flour dusted rolling pin, roll each piece into a disc, about 9cm in diameter. You can use a 9cm diameter cookie cutter to trim off the edges and make them into circles. Dumplings are traditionally served with a vinegar and soy sauce dipping sauce. Here is my version of it. You may leave out the chili or use less, if you don't like it hot. Combine the vinegar, soy sauce and chili (if using) in a small bowl. Stir well. Pour the sauce into individual dipping bowls and add the ginger and garlic. Serve the sauce as a condiment with the fried dumplings. 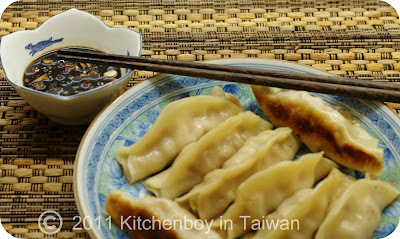 Fried dumplings are quite versatile because you can change the filling as you like. The more traditional filling is most definitely pork and cabbage, but you can also use shrimp or beef. 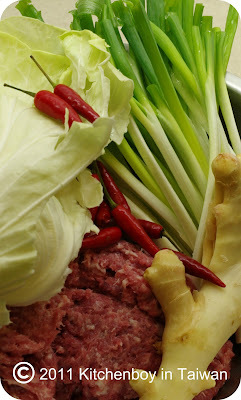 The cabbage is usually added to add more flavor to the dish. Make the filling by combining all the ingredients. Leave the filling to chill in the refrigerator for 30 minutes. Fill the wrappers by following the video below. Heat the oil in a frying pan over moderate heat. 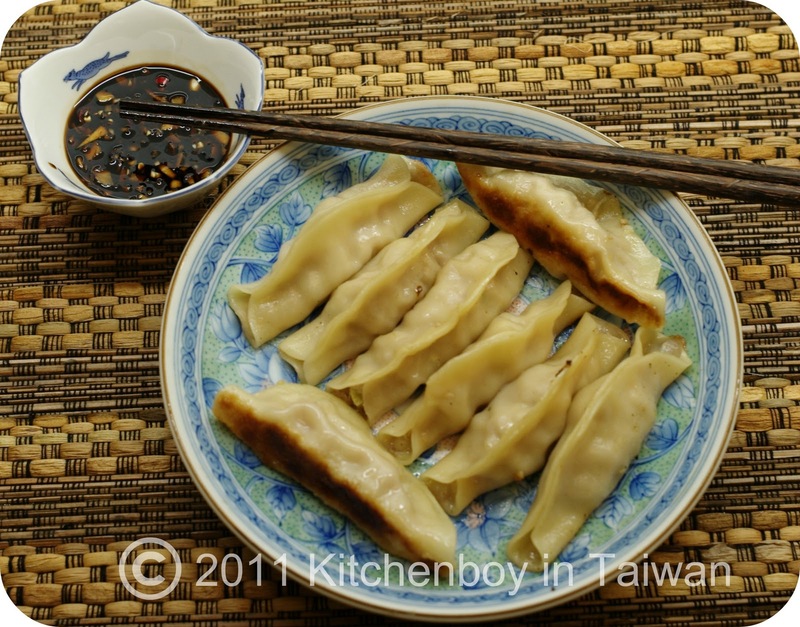 Arrange the dumplings on their bottoms, side by side without too much space between them. Cover the pan with a lid. Fry them until their bottoms become golden brown and crispy. Meanwhile, mix the water and the flour in a cup. Add the water and flour mixture and cover the pan with its lid immediately. The water should sizzle and steam the sumplings. Turn the heat low as soon as the water has completely evaporated. Cook the dumplings for a further 2 minutes. Remove from the pan. Serve hot with dumpling dipping sauce. Thanks for trying my recipe Kitchenboy! So sorry for the late comment here, but thank you! Hi Bee! Thank you for allowing me to use your recipe! They were absolutely delicious! Thank you for inspiring me to try my hand at Chinese/Taiwanese cooking. And thank you for the visit!